I am slowly working my way through the beers of Prost Brewing out in Denver – at least the ones that end up here in Madison. My introduction to their biers began with the very unimpressive Altbier. Prost rebounded with the very tasty Pils. And now I am ready to spill the beans on their Weissbier. The brewery strictly adheres to German styles, if you haven't noticed by now. Ah, the weissbier. A wheat ale whose yeast produces distinctive flavors that can taste like banana, clove, bubble gum, et al. It was my brother's favorite bier and, since his death last year, I've been unable to drink one and not think of him. It's a bit like that song from your youth that is ineluctably linked in your brain to the bad old days of high school or perhaps to your first special someone. With a good weissbier comes my brother's smiling face and many a happy memory such as when he was singing "Squonk" by Genesis in my kitchen several years back. Objectivity and weissbier are forever separated for me. 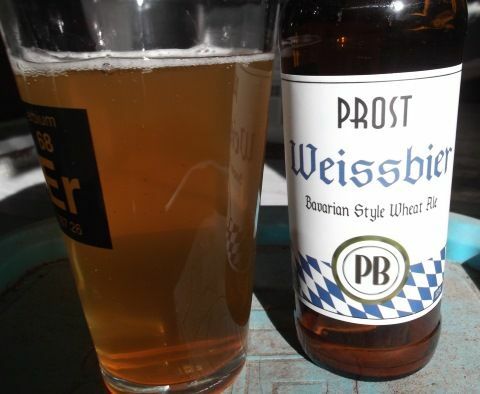 Prost's Weissbier – they're pretty utilitarian when it comes to naming their bier – pours a lovely cloudy light gold. The haze is from yeast left in the bier as well as protein from the large amount of wheat used to brew it. I expected a bigger head than I got from my pour. What can you do? But it was a brilliant white. Sadly, it didn't stick around very long. There was, however, a goodly number of bubbles in the bier itself going up. Unfortunately, my weissbier glasses are all packed away and I'm sure they would have helped Weissbier put its best foot forward visually. Still, it looked pretty good in a shaker pint. The aroma was great filled as it was with banana and clove. More on the banana side of things, though, which is my preference. And of course there was also wheat/light graininess too. I believe that the stylemeisters decree Weissbiers should be made from at least 50% wheat but even more is not uncommon. Much to my delight the preponderance of banana in the aroma carried over to the taste. There was definitely some clove too, but it was less pronounced and in fine proportion for my taste buds. The wheat and malt gave a bread-like flavor which offered a moderate bit of sweetness which went well with the fruity flavor from the yeast. I tasted a little grassy hop flavor but little bitterness. And a good weissbier needs a lively dose of carbonation which this one has. The hops are applied moderately on the finish as those tasty banana and clove flavors from the yeast fade. They take on a pepper flavor which adds some bitterness and makes for a dry finish. Sadly there was no Schaumhaftvermoegen left on my glass. Weissbier is a very fine brew and I am beginning to think that my encounter with their altbier was an anomaly. I appreciated that the banana flavor was stronger than that of clove and they achieved a really nice balance between the two. While the yeast flavors were up front, the wheat wasn't too far behind. And the hops got their chance to shine at the end. The bier just had a nice flavor all around. The body was medium-light but leaned towards the latter. Add in a generous, but not too generous, helping of carbonation and you have one mighty refreshing bier. And it's a easy-going 4.5% A.B.V. to boot. I have no doubt that my brother would have heartily approved. Junk food pairing: In keeping with my brother's proclivities, I am going to recommend his favorite snack - some pretzel rods - dipped in a fine processed cheese food product sauce. 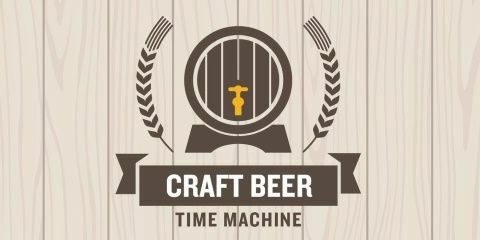 Last Thursday Wisconsin Brewing Company offered a relative rarity on tap – an Extra Special Bitter. It was part of their Forward series which introduces small batches to drinkers and then solicits their feedback. I suppose it also allows the brewers to try their hand at something different - a new ingredient, perhaps, or a style which wouldn't warrant massive quantities. I headed down to Verona with a friend who had lived in London for a year where he acquired a taste for English mild ales, bitter, and the ESB. He's fond of the ESB at The Great Dane downtown but, overall, doesn't get to indulge his taste for English real ales too often here in the land of the IPA. We were both a little apprehensive as the e-mail invite described the beer as having "a focus on bittering hops" which we thought may be their way of saying that it's really an India Extra Special Bitter Pale Ale. My friend quipped that he wanted something warm (well, cellar temp), flat (natural carbonation), and malty. I've read quite a bit less about English beer styles than I have those from other countries and drank less of them too. (I have reviewed one ESB prior to this: ESB Amber from Saugatuck Brewing.) From what I gather, the ESB is a stronger and more full-bodied bitter. And a bitter, contrary to its name, is all about the malt. Your ordinary bitter is a true session beer, usually under 4% A.B.V. They have a healthy malt taste along with a fair amount of hops for balance. And so the ESB is the bigger cousin of the bitter. More maltiness, more hoppiness, and more alcohol. But this no imperial mega-quad that can fuel jet planes. We're talking more along the lines of 5%. WBC's ESB is (or perhaps was, by now) 4.7% A.B.V. and 33 I.B.U. which perhaps comes in at the low end of ESB spectrum. My companion seems to have mistaken the ESB for the ordinary bitter as he felt the alcohol content was too high here. The beer was offered both on cask - served via a beer engine - and keg - your normal keg with gas pumped into it. The difference between the two is that a beer engine has a piston which goes up and siphons the beer out of the cask while your more familiar tap sees gas pumped into the keg which pressurizes it. Open the tap and the high pressure flows to the low. We, of course, went with the brew from the cask. The beer was copper in hue, perhaps with a slight orange tint, and very turbid. I have to admit that I don't know if an ESB should be clear or not. My glass came topped with a big white head that lasted a good long time. I couldn't see any bubbles inside the beer. The aroma was wonderful. There was some expected caramel as well as toasted grain. The great part was that it smelled like a brewery. That grainy smell that greets your nose when you walk into a brewhouse – that's what this ESB smelled like, in the main. Although the hops couldn't compare to the malt, they were not exactly slouches. Here I smelled floral/grassy hops with perhaps just a touch of citrus in the background. At this point we were convinced that this wasn't some kind of Americanized take on the venerable English style where it was dry hopped with Cascade and then aged on a bed of Citra inside a bourbon barrel with brett. It was hard not to notice the relatively warm temperature the beer was served at. Quite a change of pace after having quaffed a bunch of pilsners recently. Similarly the rather low carbonation also stuck out to me. Just like the aroma, the taste had an emphasis on the malts with toffee and plum flavors lending a touch of sweetness but there was also a distinctly less toothsome biscuit flavor as well. WBC did not reveal any ingredients to use proles but the hops tasted like what I think of as being classically English – very grassy. They were quite tasty and kept the malt sweetness in check. Those malty flavors faded quickly at the end allowing the hops to take on a slightly more intense straw taste and increase the bitterness as well which left my tongue rather dry. ESB left some really nice lacing inside my glass (plastic). There were streaks, patches, spots – the whole nine yards. While I cannot compare WBC's take on the ESB to something I'd find at a pub in England, I really enjoyed it nonetheless. It had a light-medium body with a definite emphasis on the malts but it was not overly sweet. I don't know if WBC used traditional English hops like Fuggles or East Kent Goldings or the nearest equivalent. Regardless, the grass and straw hop flavors were wonderful and a welcome change from the spicier Noble flavors I've had recently. With the trend leaning towards tropical fruit tasting hops, these kinds of flavors are often lost in the shuffle. While by no means a big beer, it was not short on taste. But it wasn't about bullying your tongue. Rather, it gently plied it with malts and then some grassy hop bitterness to balance things out. Easy to drink more than one. Junk food pairing: Crisps! Eat potato chips with your WBC ESB, especially the ones with weird flavors – those Lay's chips that were crowd-sourced. The current batch has gyros, reuben, and biscuits & gravy. Chicago's Forbidden Root continues to brew against the grain by making beers that decidedly deemphasize hops and instead forage through herbs, spice, berries, nuts, and so on to find unique flavors to add to their brews. And since I last sampled one of their beers they have gone and opened a restaurant that serves food as inventive and off the beaten path as their beers. Back in December I had Shady Character, a porter brewed with black walnuts, licorice, roasted chestnuts, star anise, and tellicherry pepper. On a recent venture to Chicagoland I grabbed 4-pack of Sublime Ginger as it looked to be a light thirst quencher and it seemed that warm weather was just right around the corner. Ha! Rain and cool temperatures moved in not long after I bought this beer. Sublime Ginger is brewed with fresh key lime juice, ginger, honeybush, lemon myrtle. Like most people in my position, I had no idea what honeybush and lemon myrtle were as I pulled the 4-pack out of the cooler. I find it alternatingly intriguing and frustrating to drink gruits and so-called "botanical beers" such as Sublime Ginger. Trying new foods is a fine thing. Broaden your palate, I say. One might begin cooking with a new ingredient after having become enamored with the taste. But is also slightly vexatious because, not having tasted these botanicals before, I don't know if I can even taste them much less what they might add to the brew's overall aroma and flavor. How do you relate to someone else what an ingredient adds to a beer if you don't know what it smells and tastes like? This is a minor gripe, to be sure, and the pleasure of drinking the beer and trying something new outweighs any frustration. But such reviews tend to be inferior for my tastes. I sampled Sublime Ginger on a rather nice and sunny day. Out on my porch the sun highlighted the beer's lovely light gold color as well as its clarity. I need to become a little more aggressive with my pours because I think my last 20 reviews all mention a "small [insert color here] head" and this was no different. What's a guy got to do? Just turn the bottle upside down and put it in the glass? Anyway, the poor excuse for a head dissipated quickly while there was a smattering of bubbles in the beer. This is one of those beers that reeks – but in a good way. I love being able to smell a beer's aroma even if my glass is several inches away from my proboscis. It's a sly bit of seduction that heightens your senses and builds anticipation. In this case, I caught a prominent bit of citrus. A proper sniff revealed more depth to that scent than my initial impression. Sure, I could smell the Key lime juice but was that lemon myrtle in there as well? The ginger was also happy to let your nose know it was an ingredient. It smelled rather fresh yet mellow at the same time. Not as pungent as, say, some Jamaican ginger beers I've had which have a sharp ginger aroma. There was also a little bit of pepper too. Not strong, mind you, but it was there. While the citrus was bigger than the ginger in the aroma, the lime juice (and the lemon myrtle?) stepped aside on the taste. There is a reason for ginger be mentioned in the beer's name. While up front, the ginger flavor itself wasn't very sharp. It mixed well with a hint of pepper. The lime/citrus came next followed closely by a nice, vaguely sweet floral taste which I suppose could be the honeybush. In the background was a light grain/wheat flavor but there was also some malty sweetness. The finish saw the ginger linger and offer a little bite in concert with the carbonation making for a rather dry ending. Alas and alack, there was no lacing left on my glass. Sublime Ginger was incredibly tasty. While the ginger did not have a very sharp taste, it did retain a little zestiness which mixed well with the tangy citrus flavors. Both of these played against the malt sweetness which highlighted the floral taste that may or may not have come from the honeybush. To top things off, the carbonation put a fizzy spin on all of the above. With its light body (and 3.8% A.B.V.) this botanical alternative to the ubiquitous shandy makes a fine brew for enjoying in the summer heat. 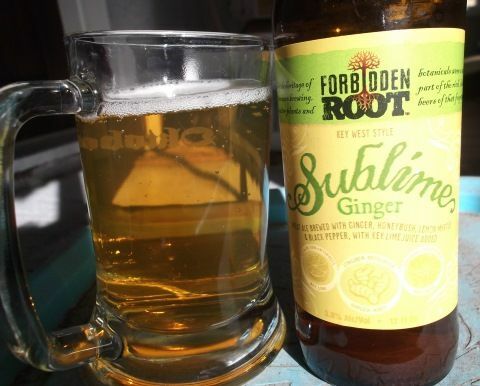 Junk food pairing: Sublime Ginger is a light-bodied brew with brighter, more airy flavors and so it requires a food pairing on the lighter side. El Rey tortilla chips are made in Milwaukee and they are thin, light, and crisp – perfect for dipping in some kind of pre-made queso processed cheese food product kind of sauce. Just keep both the heat level and the cheesy sharpness at a low level. The Great Peshtigo Fire consumed 1.2 million acres of forest in northeastern Wisconsin, ravaging a sizable chunk of Marinette County as well as parts of Oconto and Brown counties and it extended into the Upper Peninsula. Estimates of lives lost vary between 1,200 to 2,500 people. The town of Peshtigo was destroyed as were several other communities. This massive fire would certainly be more well-known today if it hadn't begun on 8 October 1871, the same day as the Great Chicago Fire which destroyed a large portion of that city and slandered one Mrs. O'Leary and her cow forever. But this forgotten fire has given a name to one of Wisconsin's newest breweries, Forgotten Fire Brewing Company. The brewery's website describes the company as a partnership between Lindsay & Joe Callow, proprietors of Forgotten Fire Winery in Marinette (just east of Peshtigo), and Point Brewery. The Callows hope to open a brewery at the site of the winery at some point in the future "if laws allow". Forgotten Fire's beers seem to have arrived in Madison with little fanfare. I first noticed them on store shelves last month where I spied Hopstinguisher, a session IPA (5%?!) and 5 O'Clock Beers, an amber lager. They also apparently make Cherry Radler, but I have yet to see that in Madison. I recently tried the lager. Of course. 5 O'Clock Beers get its name from the practice of employees at the winery who switch from wine to beer at 5 o'clock on Fridays. The beer pours a lovely clear amber. I was only able to produce a small head which was light tan and loose. While it dissipated rather quickly there was a fair number of bubbles inside my glass. Not a bad start to the proceedings. The beer's aroma was definitely on the sweet side of things with prominent caramel and apricot scents. Lurking in the background was a little grassy hop. After having had an overly carbonated beer last week I am still quite sensitive to carbonation. And I am pleased to be able to report that it was well- but not maxi- carbonated. There was a little fizziness and some attendant dryness but no real bite. 5 O'Clock is medium-light bodied and had a nice roasted grain flavor and all that sweetness in the aroma came through as just a little toffee here. As with the aroma, there were some hop flavor lurking in the background but it was fairly spicy instead of grassy. A tad of malty sweetness came through for the finish and lingered a short time before the hops made their final appearance with a fine but mild mix of straw and black pepper. There was no lacing to be had. I really liked the hops in 5 O'Clock Beers. It begins as a grassy aroma and evolves into a tasty bit of black pepper on the finish. It's too bad that the hops are so mild. It is also a shame that the malt flavors are wort-like and the beer's taste is a bit thin. The hops are weak and not given much to work with to try and tie things together and so the overall effect is clean but lacking crispness and a firm malt foundation. 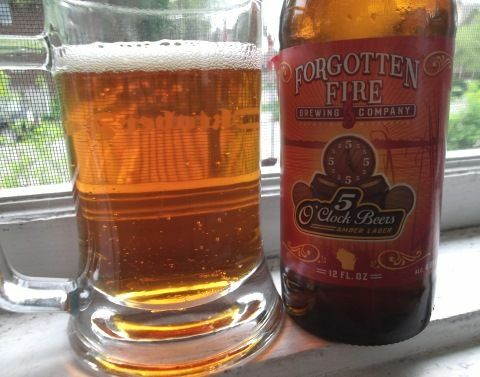 Forgotten Fire's initial offerings aren't big brews and 5 O'Clock is an easy-going 4.8% A.B.V. I'd be thrilled to have an everyday beer like this at my disposal. Despite the bonhomie of the beer and its appeal to Wisconsin history, Forgotten Fire are going to have to do quite a bit better than this to displace Sprecher and Capital in the hearts and livers of Wisconsin amber lager drinkers like myself. Junk food pairing: I say keep the igneous theme going and let your 5 O'Clock Beers put out the flames from a bag of Blair's Death Rain Habanero Pepper potato chips. Evan has arrived just in time for summer. 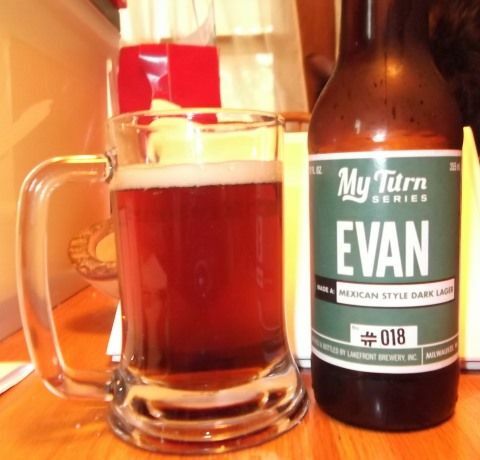 Milwaukee's Lakefront Brewery introduced its My Turn series in the autumn of 2011. For My Turn brewery employees choose a style to brew or to have brewed on their behalf and this has resulted in some very tasty beers since then. Luther is one of my favorites and not just of the My Turn series. It was a fantastic brew that stands as one of my all-time faves. In this case, the eponymous employee is a third-shift brewer and he chose to make a Mexican-style dark lager. There is nothing quite like a cold, crisp cerveza while lying around on a Mexican beach. That there is no shortage of cold lagers from Mexico is due in no small part to waves of German immigrants who went to Mexico in the latter half of the 19th century and brought their brewing traditions with them. (These immigrants also brought accordions and so we have music such as tejano and conjunto.) I tend to think of Mexican cervezas – the macro varieties, anyway – as being light and somewhat watery. I don't mean this disparagingly because I drank many a Tecate when I was in Mexico and think that Negra Modelo is pretty tasty regardless of where I may be. I wonder if this tendency towards lighter-bodied beer is strictly the result of Mexico's climate or perhaps other reasons are at play such as ingredient availability or Mexican brewing laws. There is surely also a thesis paper in there somewhere: the influence of German immigrants upon the Mexican vs. American brewing industries. In order to simulate drinking a cerveza in the Mexican sun, I did some work around the house which consisted mostly of packing and moving boxes around since it was relatively cool outside. Evan pours a lovely clear copper. I was relieved to get only a small (maybe ¼ inch) light tan head after that wildly over-carbonated bottle of Bear Bare. It went away rather quickly while there was a fair amount of bubbles inside the cerveza going upwards. The first thing I caught on the aroma was moderately sweet chocolate. This was followed by a little caramel as well as some grassy hops. Everything here was pretty mild and I couldn't smell anything with the glass a foot from my nose as I had been able to with some of the pilsners that I have had as of late. Taking a sip I found that the cerveza had a light body and a nice bit of fizziness but one which wouldn't attack my tongue with carbonic acid. There was chocolate here which was joined by the caramel from the aroma. But the taste also mixed in a more bread-like roasted grain flavor which made for a nice contrast with the sweeter malt flavors. Mt. Hood hops added a faint grassy taste in the background. On the finish all the malt flavors faded to a pleasantly restrained hoppiness. There was some grass as on the taste but there was also a stronger spiciness which threw a gentle bitterness into the mix and pushed the ending towards the dry side. My glass was left with some nice lacing in the form of goodly-sized patches all around. I managed to work up a little sweat lugging boxes of books around and Evan really hit the spot afterwards. As I expected, it was light and refreshing. I really enjoyed how the sweeter malt tastes were contrasted with the more savory ones. There are no bold declarations of taste here and Evan is a sessionable 4.5% A.B.V. While everything is on the mild side with this cerveza, it still has enough flavor to keep things interesting as you quench your thirst. Junk food pairing: Frito Lay, Kettle, and Miss Vickie's all have fine jalapeno potato chips to pair with Evan. For something a little bolder, try Late July's Bacon Habanero Tortilla Chips. A recent trek to Chicagoland meant a visit to a local bottle shop. Off Color is a Chicago brewery that intrigues me because, until quite recently, they had managed to avoid brewing a hoppy pale ale. Co-founder and brewer John Laffler once quipped, “Everybody else makes IPA, so why would we?” Instead they populated their line-up with the likes of a Kotbusser, a Gose, a Berliner Weisse, amongst other styles. And they don't necessarily brew their beers strictly according to style. For instance, their gose is actually a blend of two beers, one sour and one not. Generally speaking, Off Color, in the words of Neil Peart, deviates from the norm. And so I was happy to have finally found a four-pack of their Bare Bear, a "Finnish style sahti", after my last few visits yielded none. The sahti has a special place in my heart for a couple of reasons. First is that it is brewed with rye and I love rye – in beer, bread, breakfast cereal – wherever I can find it. Second is the tasty juniper with its piney aroma and flavor. Yeah, it is best-known as a flavoring in gin, but it also is used in pickling spice, hassenpfeffer, and many more culinary recipes. I simply enjoy its sharp, earthy taste and think it complements rye very well. I've read the sahti referred to as being part of a "folk tradition" of brewing and a "farmhouse beer" and such descriptions conjure images of drunken Finns emerging from saunas with blue alcoholic gleams. And so the style grew out of the practice of Finns in various parts of their homeland brewing beer with what they had at hand. Today it tends to refer to, at least here in the United States, an ale brewed with rye in addition to barley and seasoned with juniper berries. Plus the modern sahti has a banana flavor from esters produced by the yeast. It may or may not contain any hops. Presumably the grain bill has varied over the centuries and I've read that the branches of the juniper bush were involved instead of simply the berries. Also other herbs and spices have apparently been used at different times and places. As far as I can recall, I have only had three sahtis: Joulupukki by Vintage Brewing here in Madison, Sam Adams' Norse Legend, and Lammin Kataja Olut from Finland. Finding one is a rare treat. Bare Bear has a lovely amber hue and very cloudy. After reviewing four pilsners in a row it was really nice to have a beer before me which was not yellow and clear. When I tried Off Color's Scurry last year I found that my bottle was over carbonated. 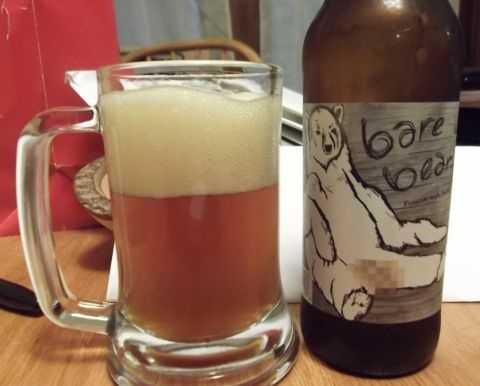 Well, memories of that brew came flooding back as I poured Bare Bear. I got a solid, tan head that was ginormous. The din of the fizzying and the bursting of the bubbles could be heard a foot away from the mug. Inside the glass was a veritable horde of bubbles charging upwards. Crap. Shaking off my disappointment, I made to give the beer a whiff and caught the smell of banana wafting to my nose before it was even near the glass. Once at the glass, I smelled a pleasant earthiness which I thought was the rye and the juniper, although I can't rule out a bit of the Nugget hops in there as well. It should come as no surprise that the carbonation was quite prominent. Tasting beyond that I found that wonderful rye earthy spice, a little caramel, a hint of plum, and bread. The juniper was pretty mild with it being a piney taste in the background. And of course there was banana. It was a big estery wave accented by a little clove. I loved it! Well, except for the carbonation which, if I may paraphrase Ralph Wiggum, tasted like burning. On the finish all those tasty yeast and malt flavors faded quickly leaving some resiny juniper flavor and some hoppy bitterness too. Plus the ubiquitous carbonic bite which made the finale quite a bit drier than I think was intended. All the foam slid down into the glass so there was no lacing to be had. How sad. Underneath all the fizz and behind the carbonic bite is a wonderful brew that juggles several flavors at once quite deftly. The banana and clove from the yeast jockey for your tongue's attention alongside the earthy/spicy rye and juniper (and hops on the finish too). Underneath this tantalizing mixture is solid malty foundation that has a little sweetness and a little savory. Just fantastic. It's such a shame you have to wade through so much carbonation to get to this gustatory wonderland. Junk food pairing: Pair Bare Bear with a bag of smoked gouda potato chips. The smokiness adds another earthy layer of flavor. Cape Cod and Lay's both make this flavor chip. It was a drab, rainy evening last Friday as a coterie of Madison's craft beer industry/scene gathered at the American Family Dream Bank for a panel discussion entitled "Craft Beer Time Machine". Ready and willing to dispense their wisdom and do a little prognostication were Chris and Colleen Welch, proprietors of Trixie's Liquor and its shiny new sibling, Growlers to Go-Go; the Wisconsin State Journal's Chris Drosner, a.k.a. – the Beer Baron; Peter Gentry, owner of and brewer at Madison's One Barrel Brewing; and Otto Dilba, co-owner of Ale Asylum where he does the marketing chores, if memory serves, and is the de facto public face of the brewery. The discussion's theme was "Where will Madison's craft beer scene be in 10 years?" Chris Welch served as moderator although he added his 2¢ as well on many an occasion. Herr Welch began the evening by asking the panel what they were drinking 10 years ago. Dilba responded that he was busy creating the business plan for Ale Asylum. Frau Welch injected the first of many notes of levity into the proceedings by replying that she was using her fake ID to gain entrance into the Angelic, a now-defunct brewpub a couple of whose employees, including Dilba, would go on to found Ale Asylum. This led into a short story time in which Herr Welch told the cautionary tale of Pete's Wicked, a very popular brand in early years of microbrewing and its slow decline. And this tale acted as a prelude to much of the discussion which followed. The craft beer bubble, whether real or imagined, was oft mentioned that evening and essentially the main topic of the evening. Frau Welch opined that the bubble was still growing and not at its peak ready to burst. There were still a lot of consumers out there to reach, she reasoned. However, she admonished that the days of opening a microbrewery in your garage like Lake Louie's Tom Porter did are over. She also noted that, while there's a lot of competition out there, it hasn't become dog-eat-dog. Yet. "Who will stay relevant?" she asked. Relevant to whom or what she did not say. Without missing a beat her husband chimed in by talking of a shakeout in the industry and offered the venerable Sprecher as an example of a brewery at risk. He described them as sclerotic with 70% of their sales being soda. "Why doesn't anyone want my German-style lager?" he mocked. He continued by offering that Sprecher makes an IPA, which he deemed sub-par, only because they have to. I was confused by this because I am rather under the impression that there are quite a few brewers in this same situation. It seems like Welch was romanticizing the brewing industry by implying that only brewers who live and breathe IPAs can brew a good one. Dilba analogized that, just as you eat boloney sandwiches when you are young and then opt for higher quality deli meats when you are older and have the money to buy them, so too it goes with beer. You get a taste for quality. The Beer Baron chimed in in agreement stating that money is certainly a limiting factor. Dilba went on to state flatly, "I don't think craft has a bubble." For his part, Peter Gentry agreed with Dilba. If craft had a peak, it was a ways off. He did think that price competition was going to become more pronounced. I was happy that Herr Drosner chimed in here and alluded to the price of craft beer. It is, after all, a luxury food item. You can buy a good deal more macro lager for your buck than microbrew. This exchange also had me thinking about craft beer in Wisconsin generally as opposed to Madison specifically. How much of Wisconsin's craft sales are in the southern – and more urban - part of the state? Valkyrie Brewing up in Dallas says that Madison and Milwaukee make up 80% of their sales. Black Husky up in Pembine (and on their way to Milwaukee) say that Milwaukee alone is responsible for 80% of their sales. As rural Wisconsin loses population and the state's middle class shrinks, Madison and Milwaukee become even more important to microbrewers around the state. (Although I'd bet Green Bay is bringing up the rear.) Obviously there's more to it than this. If you're in the northwest part of the state, you've got the Twin Cities. And there's always Chicago. 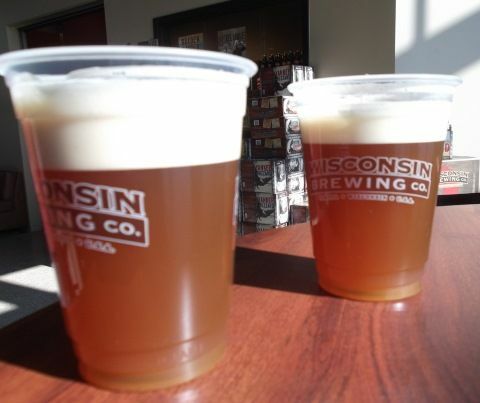 Can a new brewery make it without Madison and/or Milwaukee? This segued into discussion about beer name/label trademark disputes. Apparently Madison's Next Door Brewing and New Glarus both have a beer called "Bubbler" and there looks to be a showdown a-comin'. I wondered to myself if Kohler was going to step in somehow or if they even had any legal basis to do so. Dilba related the trademark dispute that Ale Asylum had with Short's Brewing 6-7 years ago when the Michigan brewery took issue with AA's Hopalicious claiming it was easily confused with their Huma Lupa Licious. Gentry remarked that the fellowship of the craft brewing community was dissipating and that "big boy business" stuff was coming. The Beer Baron pointed to the Lagunitas vs. Sierra Nevada feud over the latter's Hop Hunter label. With the trademark dispute section of the night over, the panel came back to the craft bubble. Herr Welch said that he'd spoken to the CEO of Frank Beer Distributors and he' quipped that there is no craft beer bubble. There will be a shakedown that involves breweries closing, however. Welch added that some breweries should close and it was hard not to recall his comments about Sprecher here. The panel was in general agreement about the craft bubble. They were all of the mind that either it didn't exist or that the market was nowhere near it. There were, after all, plenty of macro drinkers and people turning 21 to bring into the craft fold. While it is certainly true that the audience for microbrews is quite large, there is a limited amount of shelf space and a finite number of tap handles. Presumably all those Bud and Miller handles aren't going to be converted to craft overnight nor are all those 30 packs of macro light lager going to relinquish their spots on shelves in one fell swoop so it would seem that some microbrews are going to push others out. A woman in the audience originally hailing from St. Louis asked if Wisconsin beer drinkers were more critical of craft beer because of the strong beer culture here. The Beer Baron answered in the affirmative citing the comments of various out of state brewmasters who felt a need to really have their stuff together before entering the Wisconsin market. Frau Welch opined that there is a lot of Wisconsin drinking pride. I managed to slip a question into the proceedings. Having sat next to Dilba at the hearings for the "brewpub bill" back in 2007, I was curious to know what laws there are on the books that craft brewers would like to have rescinded/what laws would they like to see enacted. Both Dilba and Gentry went off on fine diatribes. Dilba warned against Miller and beer distributors as if they were the Empire in Star Wars with Darth Vader at the helm. He didn't cite any specific legislation but warned that, when the distributors try to get legislation enacted that benefits them, public outcry is needed to counteract their lobbying efforts. If my own experience is anything to go by, legislators sorely need to be educated. The unfortunate tale of Like Minds Brewing being encouraged to open in Chicago instead of Milwaukee by the state due to Wisconsin law prefaced Gentry relating his own tale of woe wherein he had to give up selling wine and spirits in order to expand his business by having his beer contract brewed by someone else. Towards the end of the evening the panel was asked to ask one another questions and do a little prognostication. There was general agreement that more craft breweries were going to be bought out by large corporations. Herr Welch related that Dan and Deb Carey of New Glarus were planning their retirement and were looking to turn the brewery over to the employees in 10-15 years. Gentry talked about expanding One Barrel but having a desire to be smart about it instead of just rushing into it. Dibla made some comments about Ale Asylum expansion and that it's taken 10 years for their beers to be available statewide and in the Chicago area as well. This prompted Herr Welch to note that there is another area brewery that brews about the same amount as Ale Asylum but is distributed in more states and has been around much longer. I presumed he was talking about Capital but they brew a fair amount more than Ale Asylum so I'm not sure to whom he was referring. Perhaps it was Capital and he just got his numbers confused. Dilba asked Frau Welch about how they decide which beers get cooler space. She said that they give preference to Wisconsin beers and then to "5 star" beers from out of state. It was nice to hear that they reserve some space for self-distributed breweries which explains why Lazy Monk can be found at Trixie's. Gentry said that he hopes to move into a new brewhouse in 2019 and predicted that there will be 8,000 craft brewers within 10 years with most of them being small brewpubs. Frau Welch thought that there will be a large increase in the number of women in the microbrew industry in 10 years. Women will make up 30-40% of the people in craft, up from 10% today. Also, cans will prevail in retail over bottles. The last word was given to Dilba who said he felt Madison had a lot of potential and could accommodate three times the number of breweries it has now. He ended the evening by predicting that, although they've only used water, yeast, malt, hops in Ale Asylum's first 10 years, they will brew a non-Reinheitsgebot complaint beer within the next 10. All in all it was a very interesting conversation. Although it featured just a small selection of people from the industry, it was impossible not to come away from the discussion feeling that all of Madison is bullish on the future of good beer. The Welches did a fine job of making me feel like a pilgarlic for my predilection for German-style lagers instead of "relevant" IPAs. No wonder I don't feel welcome at Trixie's where they and others there immediately brag to me about fresh shipments of Pseudo Sue and Zombie Dust. When I tell them I don't particularly care for IPAs and instead ask about irrelevant lagers, I can see from their faces that I have just taken the wind out of their sails. I'll pass on the Citra circle jerk, thanks. I can't help but think that Metropolitan will be withdrawing from Madison, if not Wisconsin, soon. I'm no good whatsoever at making predictions but I'll offer a few observations. Having recently bought a house, I would not be surprised at all if the next wave of brewpubs in Madison open not downtown/isthmus/campus but in Eken Park and Eastmorland. Young couples who can't afford to buy a house on the isthmus or the Schenk-Atwood area are moving to these neighborhoods. Tangentially, I believe that someone will determine once and for all why brewpubs cluster on Madison's east side. I hope Colleen Welch is right and that more women get into the craft beer business. I also hope that more people of color do as well. OK, I am going to make a prediction: I predict that Ale Asylum will collaborate on a beer with another brewery within 10 years. It may or may not be Reinheitsgetbot compliant. On a recent trek to Chicagoland my cousin helpfully noted a fine liquor store around the corner from my aunt's home. And so The Dulcinea and I made a trek over there before heading back to Madison. 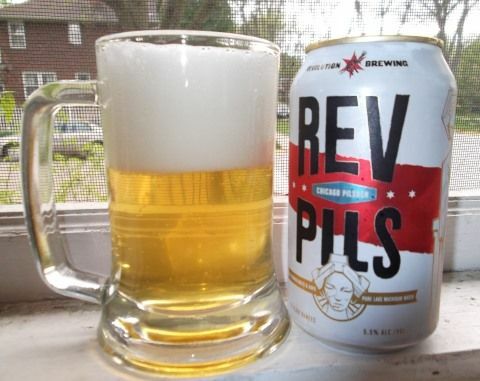 We ended up bringing home, amongst other beers, some Rev Pils from Chicago's Revolution Brewing. I've always heard good things about Revolution, most recently on The Beer Temple Insiders Roundtable, and wanted to give them another try after drinking their Oktoberfest last summer(?!) and not being particularly impressed. Now that I think about it, I did sample their wares at a pre-Great Taste event a few years back and enjoyed them. And now that I think about it some more, the wife picked up a can of one of their stouts back in the autumn and it too was tasty. Anyway, I wanted to make up for the fact that I avoid Revolution when I am shopping in Chicagoland. I tend to seek out other Chicago area beers as well as those from breweries that don't distribute in Wisconsin. Plus imports that never see Madison shelves like Helles Schlenkerla Lager. Revolution was established in 2010 and seems to have become the Big Daddy of Chicago breweries – at least of those not owned by A-B InBev. My understanding is that they are growing at a rapid pace and, well, they just always seem to top lists of Chicago breweries whenever I encounter one. When I talk to people on this side of the Cheddar Curtain, Revolution is always (along with Pipeworks) one of the top two breweries people would like to have distributed here. Revolution appears to be the Chicago beer scene's big kahuna, the top dog, the big cheese, the head honcho, number one...and so let us find out if their pils lives up to their reputation. I must apologize to Rev Pils for not having the proper glassware because it would have been a beauty. It was a light gold hue and just ever so slightly hazy, which was odd. Is this one of the qualities of a "Chicago Pilsner"? My pour produced a big, frothy cloud white head that stuck around. There was a fair amount of effervescence which would have looked much better in a pils glass. My can was dated 3/14/2016 so it was a just under two months old when I sampled it. While not extremely fresh, I did expect it to not have deteriorated too much. My expectations were met with the aroma which was a delightful blend of hops. Revolution uses German hops here - Select, Saphir and Hallertau Gold – with my understanding being that Saphir is the newest variety and that it mimics trendy American hop varieties with floral and fruity characteristics while the others are more traditionally Noble tasting with earthy and spicy aromas and tastes. The result was a big floral and grassy melange that I could smell when the glass was a foot away from my nose. Underneath that was a just little bit of fruitiness. Rev Pils has a nice light body with a modicum of cracker maltiness which means that all those hops are going to have pride of place. Floral flavors were right up front with some melon fruitiness just behind it. Further back those non-Saphir hops provided a little grass/straw flavor along with some bitterness. Those floral & fruity flavors lingered a while on the finish until the grassy hop taste swelled and took on more of a spicy complexion. And then things got really dry and bitter. There was precious little Schaumhaftvermoegen - just a few spots. Rev Pils just has big hop flavor all-around with floral tastes taking the lead followed by a good dose of fruitiness and then a bit of grass trailing behind. Until the end when a more traditional German spicy hop taste kicks in. I thoroughly enjoyed – no adored – I adored the mix of hop tastes in this beer. This is far and away the best use of Saphir hops that I've come across. The problem is that there is little malt footing. The beer's body is too light and thin to support all those hops. Consequently Rev Pils tastes rather watery. You can taste something underneath all the floral/herbal hops but it's almost more of a presence than discernible flavors. This is a real shame because Revolution really hit the nail on the head here with their blend of floral/fruity and earthy/spicy. The best pairing of these tastes in an American Nova-Pils/IPL I've had yet. Junk food pairing: I like pairing Rev Pils with a bag of Chili Cheese Fritos as I like the contrast of the hops to the gentle spicing regimen of the chips. I think this may be my first review of a non-Fulton & Wood beer from Goose Island, the venerable Chicago subsidiary of the Belgian brewing leviathan A-B InBev. Goose Island's annuals and seasonals don't get a whole lot of press – at least in the outlets that I read. Their Bourbon County beers and their sours seem to garner the vast majority of the hype with brews like 312 and Green Line getting the occasional mention which usually is about how they tasted better when they were brewed in Chicago. Ten or so years ago I'd buy Goose Island down in Chicagoland when I was heading to a gaming get-together down there. By the time they'd rid themselves of their last year-round lager, there was Metropolitan which quickly became my Chicago beer of choice. While I had tasted their sours and probably had the odd 312, it wasn't until I heard that they had brewed a (great) dunkel roggenbock this past winter that I decided to actually seek out a Goose Island beer. Four Star poured a lovely pale golden hue and was clear. I really, really wished that I'd had my pilsner glasses around because I got a nice big head that was a brilliant white. It was a little stiffer and less creamy than the ones I've gotten from the other pilsners I've had lately. Similarly, it was also a bit more effervescent than the other pilsners that have graced my glass lately as there was a goodly number of bubbles inside the beer itself. Yeah, this would have looked fantastic in a pilsner glass. So far, so pils-like. Would it smell like an IPA? It did and it didn't. The very first aroma my nose caught was that of bread – lightly toasted and not doughy and sweet. Well, there was a little malty sweetness but not very much. And then there were the hops which were very floral but not overpowering. I suppose that this is as good a time as any to mention that the beer I drank was bottled on 26 February. While not the freshest beer, it was certainly not past its prime. Having said this, I would be surprised if fresher 4 Star didn't have a more prominent hop smell to it. One thing which I really liked about Four Star is that I tasted more carbonation than the other pilsners of my current run of reviews. It just had a very lively fizziness and a little bite too. Four Star also had a medium-light body which was just a tad heavier than those other pilsners. This came through as a wonderful light breadiness in the taste that was clean and toasty instead of sweet. On the hop front there was a big old school grassy flavor that I presume came from the Mt. Hood. But there were also hops nouveau in the form of Equinox and Meridian which contributed a modicum of floral flavor as well as a lot of tropical fruitiness. Four Star finished more traditionally with grassy hop flavor and bitterness taking over for a very dry ending. Again, unlike the pilsners I've reviewed over the past week or so, Four Star stood out by leaving streaks of foam all over my glass. I am ambivalent about beers like this, specifically blending grassy/herbal hops with those that have floral and fruit flavors. False Dichotomy, the Two Brothers/Metropolitan collaboration went this route and was, to my taste, difficult to get my tongue around. While I don't think such pairings are unnatural, they simultaneously taste good and unappealingly incongruent. Perhaps I simply need to drink more of them to move beyond the gustatory dissonance. Having said this, I think Four Star generally does a nice job of reconciling the various hop flavors. Perhaps this is because it is not as big of a beer as False Dichotomy. In addition to having less alcohol (it's 5.1% A.B.V. ), it also has less hop intensity. Maybe my tongue can handle the contrasting flavors better when they are less stark. In the end, I enjoyed Four Star quite a bit. It had a nice, clean toasty malt base which allowed the hop medley to strut its stuff. Arguably it is an IPL or American Nova-Pils with the floral and fruit flavors from the Meridian and Equinox hops. Anyone going into this thinking they're going to get a traditional Noble hop experience is going to be in for a surprise. 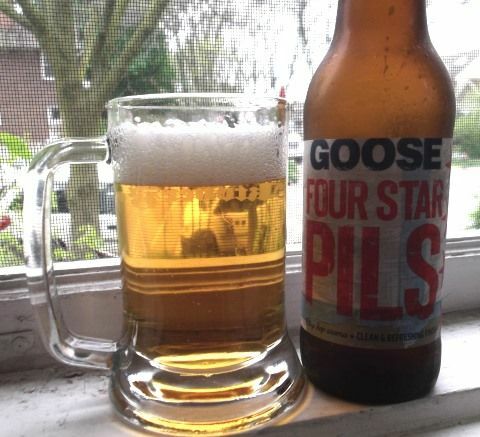 Junk food pairing: Pair Four Star Pils with Lay's Greektown Gyro potato chips. Dip them in tzatziki sauce should you have some. It doesn't seem that long ago to me that the Stevens Point Brewery, a.k.a. – Point, was basically just its iconic blue-labeled Point Especial Lager that Mike Royko famously declared the best beer in America but little else beyond this one brew. Sure, they had Point Bock and probably other beers that have been lost in the mists of time, but Point had the reputation in my mind of being a regional brewery skating by on its American pilsner and contract brewing/energy drink production as the microbrewing revolution left it in the dust. Now, I am not claiming that my perception mirrors reality in all respects. In fact, that is unlikely. However, Point has done quite a lot in the last 10 years to transmogrify their image from that of a regional brewer that survived Prohibition and consolidation doing what is has always done into that of a craft brewery eager to destroy your tongue with hops just as much as the next guy. And to this end they have a variety pack of IPAs in addition to its annual Beyond the Pale IPA; it also has a line of high octane brews – the Whole Hog series – which offers big, bold flavors in addition to higher A.B.V.s; the likes of St. Benedict's Winter Ale and Drop Dead Blonde were introduced and remain in the line-up while Three Kings, Kölsch-style brew, came and went; more recently a radler and citrus IPA have been introduced. Point is certainly not afraid to branch out and try new things. Are the folks up north just throwing stuff at the wall to see what sticks? Or are they really paying attention to and embracing trends? I suppose it's some of both. 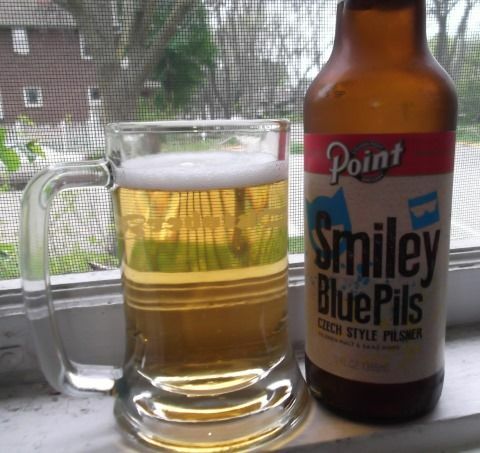 Regardless, I was rather surprised when they introduced Smiley Blue Pils as a year-round brew last summer. It's not and IPA nor sour nor barrel-aged. Then again, pilsners are something of a trend in craft brewing so perhaps I should not have been surprised at all. Smiley Blue Pils is billed as being a Czech-style pilsener and seeing the requisite Saaz hops listed on the label boded well. It poured a lovely straw color and was quite clear. Again, my pilsner glasses are all packed away so I'm stuck with a mug for a while. Getting back to the piwo, I only got a small white head but it was quite creamy. There were some bubbles in the glass heading on up but I'd expect more from a pils. The aroma had a fairly prominent fruit scent to it which was difficult to place. It wasn't doughy or like honey so I don't think it came from the malt. Instead it was light and Kölsch-like with a delicate almost berry quality to it. This was highly unexpected though not necessarily unwelcome. A more familiar aroma of grass was also present as was a little bit of cracker. Whatever that fruity scent was, I didn't get any of it on my tongue. Smiley Blue had a really nice light biscuity malt flavor from pilsner malt that had just a touch of sweetness but was otherwise nice and clean tasting. The grains kindly propped up some big herbal and grassy hop flavors which, along with a little bite from the carbonation, made for a rather dry taste. The dryness increased on the finish as the Saaz's renowned peppery flavor swelled giving off a big, firm bitterness. There wasn't much lacing to speak of as the loose foam slid down into the piwo. I was going to write something like "Smiley Blue is a surprisingly tasty pils" but realized that this sounded a bit too close to a backhanded compliment. Truth is that I really liked this beer. The gentle malt flavors were doled out perfectly here with a light touch allowing the hops their time in the spotlight. While I tend to think of Czech pilseners as having more hop flavor and bitterness than Smiley Blue, this is by no means a watered down version of the venerable style. Those Saaz really do kick in on the finish. Smiley Blue is 4.5% A.B.V. which I think is on the low end for a Czech-style pilsener. But this matches the brew's motif of toning down an "authentic" piwo and I say this not being a Czech beer expert. Point seems to have taken a traditional approach overall but pulled their beer's peaks back out of the red. It's never as spicy or dry as the Czech imports I've had. Still, it's good Squishy. Junk food pairing: You can't go wrong with a cold Smiley Blue and some pickled sausage with a handful of Cheez-It Sriracha Snack Mix. Since reintroducing myself to Sierra Nevada's beers last fall, I have been mightily impressed. I probably blathered on about this previously but it had been a long time since I'd tasted one of their brews. Their Pale Ale was a fixture of my formative microbrew years in the first half of the 1990s and it has been argued that it is the progenitor of today's IPA that all the kids go gaga for. Since that time the brewery has grown to become a macro-micro – the third largest "craft" brewery in the United States. I'm not familiar with how well Sierra Nevada has adapted to neither the tropical fruit IPA nor the barrel aging trends as I've stuck with their renditions of German styles. And I can tell you that they've done a fantastic job whether it's sticking with tradition, tweaking it a little, or turning the Reinheitsgebot on its head with abundant New World ingredients. The piwo at hand, Summerfest is, quite unsurprisingly, the brewery's summer seasonal and their take on the Czech pilsner – a "Czech-style lager", as they fancy it. I'm not sure how long this has been Sierra Nevada's summer seasonal but I read that it was first brewed back in 1992, which is ancient in microbrewing terms. I was disappointed not to have my pilsner glasses at hand when I instead poured my Summerfest into my mini-Bierkrug, the only glass drinking vessel I have that remains unpacked aside from shaker pints. This piwo deserved the tall pils glass to showcase its lovey burnished straw color which was crystal clear. The pils glass would have had a nice, loose white head up top and a goodly number of bubbles moving up the height of it. If only the foam would have stuck around a bit longer. Summerfest's aroma was essentially the antithesis of trendy tropical fruit IPAs with it's pronounced herbal and black pepper hoppiness, with an emphasis on the latter which I presume come from liberal use of the traditional Czech Saaz hops. There was also a hint of citrus too. All of this hoppy goodness was coupled with a great light crackery pale malt scent. That cracker malt scent widened into a flaky biscuit flavor that had a slight doughy sweetness. For their part, the hops retained that big pepper character and it became more grassy and took on a greener, more leafy spiciness with a fair amount of bitterness to boot. This was perhaps the Spalter Select comingling with their Czech cousins. Overall Summerfest had a nice, clean flavor that really showcased the hops well. For the finish, the malt did a disappearing act leaving the hops to work their spicy, peppery magic. They left a Saaz burn on my tongue and really increased the dryness. There was no lacing to be had. biscuity pale malt taste perfectly. 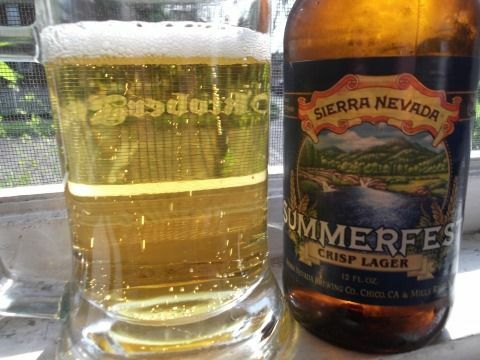 With its light body and bold hops, Summerfest can no doubt cut through the summer heat. It is 5% A.B.V. Junk food pairing: Grab a bag of salt and pepper potato chips to go with your Summerfest. The salt will replace that which you lost sweating in the heat while the pepper shall complement all the spicy hops in the beer. The last time I had a bier from Denver's Prost Brewing Company, I was not impressed and not a little disappointed. But I'm sympathetic to any brewery that refrains from brewing beer whose style has the word "India" in it and refuses to barrel age its way into the crapulent hearts, minds, and livers of the crafty clerisy. And so I recently gave the brewery another chance and smapled their Pils. 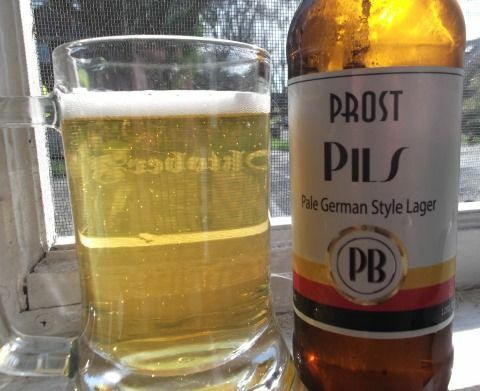 Prost describes Pils as a "Pale German Lager" which I took to mean that it was a German pilsener as opposed to being styled after a Czech variety. While someone like Evan Rail can give a whole exegesis on the varieties of Czech pilsners, my purview is much more limited. For my palate, a Czech pils is heavy on spicy/peppery Saaz hops and has a golden color which indicates a body that neither very light nor particularly heavy. Bohemian water is known for its softness which imparts other characteristics to Czech pilsners. The German pils, as I know it, is lighter and less hoppy. Plus German hops generally lean towards more grassy and herbal flavors than Saaz do. German water hardness is, however, terra incognita. It would probably be a good (and highly tasty) idea to get some Budvar, Pilsner Urquell, Staropramen, and the like to try to figure out what makes a Czech pilsner a Czech pilsner and what exactly soft Bohemian water does for their beers. I just have no idea how fresh the Czech piwo we get here in Madison is. Sadly my pilsner glasses are all packed away so Pils' lovely pale yellow didn't get a chance to show itself off. It was clear, as expected. My pour gave a small, ephemeral white head. Sadly, there were precious few bubbles in the glass. Truth be known, I didn't have high hopes at this point as I expected a much more vigorous effervescence instead of the more lethargic looking brew I had before me. However, after taking my first sniff, most of my fears dissipated in a wisp of malty goodness. Pils has a fantastic crisp cracker scent that is laced with a wonderful spicy and herbal hop bouquet. It had what I think of as a quintessential German pils aroma. But would it taste as good? Despite not being particularly effervescent, I could certainly taste the carbonation. I'm not talking champagne levels of fizziness here but Pils has a nice little bite to it. The crackery aroma translated to a light , clean biscuit taste. While I wouldn't describe it as a big malt backbone, I could never forget that there was some grainy goodness underneath the bier's big hoppiness. Pils has a bold, complex hop taste with its showcase of Noble hop flavors. There were some sweeter floral tastes carefully blended with herbal and spicy ones in such a way as to let each stand out yet coexist tastefully. Despite the prominence of the lupulin, Pils wasn't very bitter. It did, get more bitter on the finish, though. The malt and the more floral hops flavors faded and allowed the spicier and more pepper-like hops tastes through. In addition to a bigger hop flavor, there was a not insignificant amount of bitterness too which made for a bracing and dry finish. Unfortunately there wasn't much Schaumhaftvermoegen to be had – just a few scattered patches that were rather small. Prost really redeemed itself with Pils to my taste because this is a great bier. Whereas their altbier was timid and watery, Pils' light body was awash in flavor. It has a fantastic light, yet not insubstantial, malt taste that is clean and not very sweet. Atop this is a remarkably multilayered hop flavor that blends floral and herbal flavors along with a kick of spicy/peppery zing and proves that hops need not taste like various tropical fruits to have complexity. Junk food pairing: Pils goes well with soft pretzels accompanied by a generous portion of a sharp cheese food product like Velveeta. The final entry in my short run of brackett tastings is a fruited take on the style - Rogue's Marionberry Braggot. A mead made with fruit is called a melomel so perhaps this could be called a melobraggot. A bragomel? They just roll off the tongue, doesn't they? If you use it like a mouthwash, does it become a Gargamel? I'm here all week. Tip your servers! Rogue Ales is located in Newport, Oregon and I will cop to not being particularly familiar with the brewery. I have reviewed only one of their beers - Roguebier Rye Ale, which I liked. And that is about it as far as my Roguish knowledge extends. Marionberry Braggot is apparently part of the brewery's Rogue Farms series which I presume means that some percentage of the ingredients in the brew were grown on a Rogue farm. Rogue farms grow grains, hops, fruit, nuts, and also raise animals. I am sincerely hoping that I never see a Rogue free range chicken beer on offer. The label indicates that several of the braggot's ingredients were grown on a Rogue farm including marionberries. I had to look them up because the name didn't sound at all familiar. 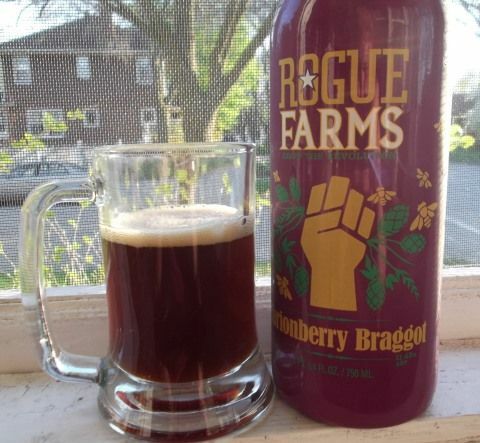 Marionberries are a variety of blackberry brought to life in Oregon in 1956 which makes them hyper-local for Rogue. As with the other bracketts and braggots I've sampled recently, my bottle of Marionberry Braggot has been aging in my cellar since I bought the bottle in 2014. That was a big year for braggots, apparently, as my previous two were also vintage 2014. That trend petered out quickly. Marionberry Braggot pours a deep brown that has a reddish purple tint. Just like Sprecher's brew, this one was very turbid. I got a small light tan head that lasted for 20 seconds or thereabouts. If I held my glass to the light just right I could see some bubbles going up. The aroma was very sweet with a lovely honey scent being supported by the marionberries. This certainly had the sweetest aroma of all my braggots. The same can be said of the taste. Not only was the honey prominent but also fairly sweet. This braggot is 11.42% A.B.V. which makes me wonder exactly how much honey was used to make it that big and with that much sweetness. The berries were not shy about making themselves known either. They added a touch of sweetness and a bit of tart berry goodness. I was happy to taste some carbonation as well because it really helped tone down the sweetness. This is a big, boozy beverage and I could most certainly taste it. That boozy heat was fairly restrained until the finish. Here the honey faded leaving the marionberry to deal with the alcoholic heat. I'd swear there was also a little bit of spicy hop bitterness in there for good measure. Lacing was completely absent. Just like Sprecher's Braggot, Marionberry has large booze component to it. I think the marionberries and the marionberry juice helped tone down the alcohol sting here but it had still a very warm, astringent taste, especially at the finish. Beowulf could have made Molotov cocktails with this stuff and dispatched Grendel and his mother with ease. In addition to having a great honey flavor that of the perfect level of sweetness, I really liked the fruit in this braggot. It made the brew a little more toothsome but also added some tarteness at the same time. However, just as with its Sprecher cousin, the alcohol taste was just too strong for my palate. It was too strong and stood out from the honey and fruit too distinctly. It may very well be my lack of cellaring know-how but, considering that Honey Queen didn't seem to suffer from a similar period of aging in my basement, I am beginning to think that high potency braggots are either fated to be fire water because grain somehow throws a spanner in the works or Rogue and Sprecher need to practice braggot making. Meads/melomels with higher A.B.V.s than 11% don't taste like this nor do (all) beers of double-digit potency. Surely this means I must conduct more research. Junk food pairing: Marionberry Braggot pairs well with Hostess fruit pies or their nearest generic equivalent. They will help take the edge off and complement the fine marionberry flavor of the brew. Three – three braggots!! Ah, ah, ah, ah! Number three comes courtesy of Sprecher Brewing in Milwaukee. Sprecher is one of the granddaddies of Wisconsin microbrewing having been around since 1985. Sadly, I've read that they make more soda than beer these days and lately they've been making hay with the hard soda trend. And even more recently they've released a bevy of radlers to jump on the shandy/radler bandwagon that Leinenkugel built. This is a shame became Sprecher Amber is a fantastic bier and I used to drink it by the gallon (it seemed) back in the 1990s when I spent more time than was healthy at the Paradise Lounge. Black Bavarian is also extremely tasty and I enjoy their seasonals quite a bit too. Yet I feel that the brewery is perceived as something of a one- or two-trick pony. An Amber or Black Bavarian when taking a brief respite from hoppy pale ales but that's it and only occasionally. Yet Sprecher introduced two gluten free brews back in 2006 or so and have a line of fresh hop beers; a Belgian quad for an anniversary brew and sundry ales. I just view Sprecher as being a very good brewery with many tasty offerings that has more going for it than Bavarian-style biers but just hasn't been able to find its beer niche in a world of IPAs, sours, and barrel aged brews. Perhaps they are doing better than I realize and just fly under the radar without a trendy beer that causes a brouhaha upon release. If I'm right, then hopefully moving to 12oz bottles and some new labels that shed much of the traditional German imagery will appeal to younger drinkers or simply drinkers who ignore them. Back in 2014 Sprecher released their first ever braggot. I picked some up and have finally gotten around to dragging one out of the cellar and busting it open. As with my previous two bracketts/braggots, Sam Adams' Honey Queen and Viking's HoneyMoon, Sprecher's extolls the virtue of aging right on the bottle: "This product can benefit from extended aging when properly stored." I aged mine about two years in my cellar away from light and in at least moderately cool temperatures. You will never hear me brag about my cellaring prowess but I feel that Sprecher's brew was treated well. It poured a deep yellow that was as cloudy as all get-out. I don't know if this is normal but I'm not afraid of some haze. I did not get any head in my glass and the braggot was so turbid as to be opaque so I couldn't judge the brew's effervescence. At this point I was unsure if I completely ruined the braggot in my basement and was about to go 1 for 3 or if all was well and these were just the meady equivalent of crow's feet and laugh lines. I felt relief when I got a billow of honeyed sweetness up my nose. Braggot had a very sweet aroma overall with some bread dough in addition to the honey. 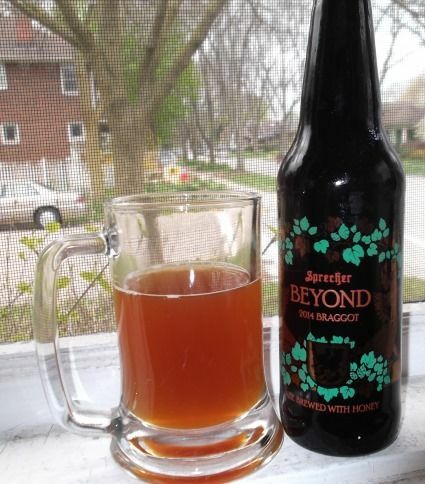 Considering that the bottle had been in my cellar for almost two years and the brew had been aging in Sprecher's vats for something like 18 months, I was quite surprised to smell what I thought were hops – floral hops – that were accented really nicely by all the syrupy sugars. It wasn't surprising to find that this hazy honey-colored nectar had a fairly heavy body. While it was not a sticky, viscous liquid like honey itself, it was much more hefty than the other braggots that I'd had. There was a luscious honey flavor yet there wasn't a whole lot of sweetness. Braggot has an A.B.V. of 11% so most of the honey sugar was eaten by the yeast and turned into alcohol but I expected a bigger malt sweetness. There was some but it tasted like the malt added more body than flavor. I also caught a little carbonation as well as a not insignificant burst of peppery hops which added an unexpected bitterness. Then the bitterness melded into a big boozy sting. While there was a little lingering sweetness at the end, I mostly tasted alcohol heat. I think all the booze in Braggot chased away the lacing because there was none. Sam Adams' Honey Queen was a balanced and gentle libation in contrast to this highly potent potable. Sprecher has come up with something that I could imagine being consumed in Hrothgar's hall where the king and his fighters drank it to forget about Grendel for an evening. I found Braggot to be harsh and abrasive – the Sam Kinison of beverages. The alcohol cut through the really nice honey flavor easily and left my tongue afire. I am hoping that the rest of my stash of Braggot mellows out with more aging. Junk food pairing: Get some Chicken in a Biskit crackers and slather on a generous portion of honey butter. 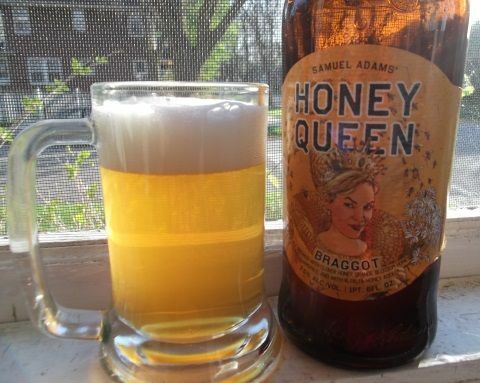 My brackett mini-marathon continues today with a braggot from Sam Adams - Honey Queen. It's part of their Small Batch Collection which comes in bombers. I've really enjoyed a few of the Small Batch brews including a rauch bock and a sahti so of course I've not seen them since those first highly pleasurable dates. I'm not sure if this is because they're no longer being brewed or they just aren't available in Madison or if I am simply looking in all the wrong places. My previous brackett review was of a c. 2009 brew and I was saddened to taste that it had gone south. My bottle of Honey Queen was of a much more recent vintage – 2014. The bottle explicitly says "Enjoy now or age it to further develop rich and unique flavors" and this, combined with the fact that the bottle had been away from light in my cellar, made me mildly hopeful that I'd have a drinkable beverage upon decanting. Honey Queen pours a dark yellow. I was surprised to find that it was a touch hazy. I don't know why but such was the case. My pour produced a nice head that left my glass adorned with a brilliant white and very creamy head. It didn't last a particularly long time but long enough- perhaps 20 seconds or so. There were some scattered bubbles inside my glass going up. I was a bit anxious putting the glass to my nose for the first time. However, I was greatly relieved when I smelled slightly sweet honey but, more importantly, a distinct absence of vermouth. There are hops and chamomile in this braggot and they came across as a pleasant mild herbal scent. Beneath this sweet, floral-herbal mélange was some crackery malt. A dramatic improvement over the senescent brackett from a few days earlier. By no means am I a braggot expert. How much should one taste like mead? How much like beer? I suppose that as long as you have some of each, you're in like Flynn. Honey Queen had a rather big floral and slightly fruity honey flavor up front. However, it was only slightly sweet. Underneath it was a light, biscuity malt flavor. And tacking its way through the two was a mild herbal & floral flavor which was hops and chamomile in concert. The herbs gave a little bitterness. That great semi-sweet honey flavor lingered at the finish and was then joined by a swelling of herbal flavor along with a modicum of bitterness that made for a pleasantly dry ending. Honey Queen left some nice lacing on my glass with a scattering of spots and a couple large patches. I was quite relieved to find that my bottle of Honey Queen hadn't gone bad. Indeed it was a real treat. Sam Adams says that it was made with three kinds of honey – Clover, Orange Blossom, and Alfalfa – but the differences amongst these varieties is beyond my ken. (Any honey sommeliers out there?) But I can tell you that they made for a fine floral sweetness on my tongue. Honey Queen has a deceptively light body that feels a bit heavier when the honey sweetness is at its height. There are also three kinds of hops - East Kent Goldings, Strisselspalt, & Aramis – and they, along with the chamomile, add a pleasant, mellow bit of herbal flavor and just enough bitterness to make for a noticeable contrast to the honey. Honey Queen is 7.5% A.B.V. so it's either a big beer or a small wine depending on your preference. Regardless, it is extremely tasty. Junk food pairing: I like to pair braggots with foods that emphasize the honey. Try some of your favorite honey mustard pretzels with Honey Queen.